A middle-aged security man, Mr. Okom and his wife, Mrs. Blessing Okom, have expressed gratitude to employees of leading telecommunications services provider, Airtel Nigeria, for donating the sum of one million naira to save their eight year old son who was battling with complications from a botched appendectomy procedure. 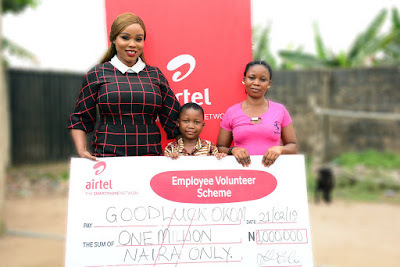 The condition of the lad, Goodluck Okom, caught the attention of Airtel employees after the family had actively sought the help of Nigerians through social platforms. Moved by Goodluck Okom’s situation, Airtel employees under the company’s Employee Volunteer (EVS) scheme came to his aid after visiting his family home in Ogijo area of Ikorodu, Lagos. The Airtel Employee Volunteer Scheme is a special purpose vehicle created for employees to offer their time, personal resources/money and skills to support relevant and credible charity causes. The Airtel EVS has created huge impact as employees have raised substantial funds, provided relief to many families, with a trickledown effect of touching the lives of thousands of people. Commending Airtel employees for the gesture, Mrs. Okom, unemployed, said, “I want to thank Airtel for saving my son’s life. I also want to thank the workers of Airtel for all they have done. God bless you all for us”. “Prior to Airtel’s contact with Goodluck, his condition had left him incredibly emaciated, which stopped him from walking and he was mostly bedridden,” said the father who works as a security guard in Ikorodu, Lagos. Following Airtel’s intervention, another surgery was carried out by a team of qualified surgeons at a children’s hospital in Surulere, Lagos, where Goodluck recovered and was later discharged. Today, Goodluck is healthy, hearty and full of life and he is able to share a smile and engage in regular activities like his peers. Airtel is intensely interested and committed to supporting laudable causes through its Corporate Social Investment initiatives in Nigeria. Leveraging on its award-winning Touching Lives programme, Adopt-a-School initiative and Employee Volunteer Scheme, it has invested to assist many communities as well as uplift thousands of underprivileged people across the country.